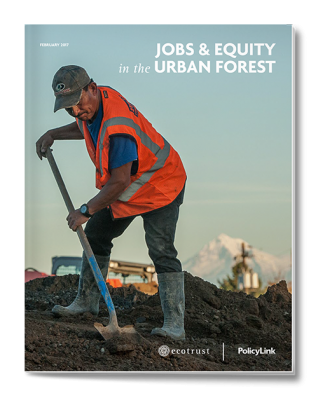 A partnership of PolicyLink and Ecotrust, with extensive input, review, and data assistance from Verde Portland, Jobs and Equity in the Urban Forest examines the economic, ecological, and social impacts of existing community based urban forestry investments designed to benefit low-income communities and communities of color. In addition, the report makes recommendations for a wide range of groups with influence in urban development, workforce development and advocacy, environmental justice, and municipal policymaking to aid in expanding green infrastructure opportunities for historically disenfranchised communities. This work was funded by the US Forest Service’s Urban and Community Forestry program that focuses on the stewardship of urban natural resources.